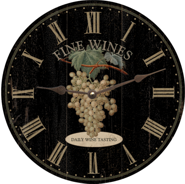 Beautiful Wine Clock . 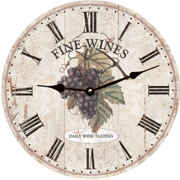 Our Wine Clock (Shown with Pendulum) is available in 8 variations and reads Fine Wines- Daily Wine Tasting. We are a 100% Made in the USA Company. Even our Quartz Clock Movements are made in the USA! Our clocks consist of high quality prints that are hand mounted and finished. Each clock is carefully assembled and finished by hand. This colorful wall clock is created from a full color print that is laminated on a laser cut 1/4" wood clock dial. The image was taken from an antique 18th century botanical print old tile and features a white grape bunch. 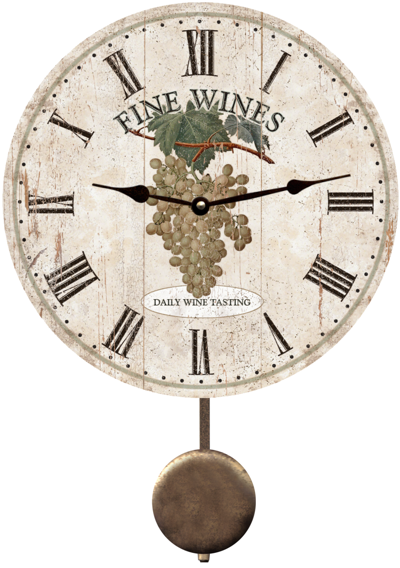 "Wine Clock " Shown with pendulum option. 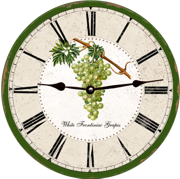 Daily Wine Tasting Wine Clock.